back yard is not really level so there might be some digging involved to put the play set in. 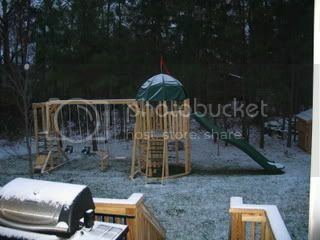 When I was asking around about playsets the name Backyard Playgrounds came up several times. I have seen the sets in person & they are very well made & sturdy. They use treated pine to make their sets. I was a little leery of using pine, but the biggest deterient to me was the price. From those who I talked to tho Backyard Playgrounds was cheaper than the other places like Rainbow, Creative Playthings, etc. We ended up buying a set from Costco & putting it together ourselves. You got a lot more for your money by doing it yourself. I heard from someone else that you can buy a set like at Costco and pay someone to level & put it together for you for about $500. I thought the Rainbow sets on display at Child Space/USA Baby in Cary beside of Best Buy were very well made and nice. Someone on another board I belong to spent around $4K for a set from them and was not very pleased with it. I have a little experience in this arena, so I will add my pennies. I built our childrens set from a kit you can get at home depot or lowes. I took about half a day and total cost was around $400.00. It has everything that the other sets have, just not the price tag that goes with it. I am sure you could find a handyman to put on up for you for a reasonable cost. It is still very sturdy and has been up for around 7 years. It has been used and abused by all the kids in the neighborhood so the investment was a good one. Hopefully it will help sell my house as well, lol. Hope that helps. We recently bought a set from Costco and hubby put it up. In fact he just finished it last weekend. All the kids our and the neighborhood kids love it. I've seen several postings on Craigslist for people who offer the service to put together the kits. You might try posting at Trianglemommies, you may find someone who has hired someone. Do you have a swingset already or are you looking to purchase one with a company that will have the area ready and leveled for you. We looked at Woodplay on Lumley Road and they sent someone out to look at our yard because we had some of the same issues. You can get the whole package from them. We decided on Creative Playthings because I liked the sets better and they were cheaper. We hired our own landscaper to get the ground level and ready for us before they installed the swingset. I did a kit from Home Depot last year for $600. If you're even reasonably handy you can put it together. There's no cutting involved, not even drilling as all the screws are self-tapping. Just stick some wood into a piece of metal and screw it together. Note you will also have to budget for kid-safe ground cover which can get very expensive if you also have to install a raised perimeter to hold in the mulch or whatever you choose. The last thing you want is a kid jumping off the swing onto hard packed earth and breaking a leg. It's just about as nice as the $1500+ Creative Playthings set my neighbors have and is really only lacking a nice wood roof and first floor flooring. Both of which I assume I could add myself if I was that inclined. Mostly kids just want swings and maybe a slide. The pirate rope ladder thing gets a lot of use, too. I've heard good things about Woodplay. Friends of mine have had additions put on their playset. They were able to hook up with a worker who used to work at one of the playset companies and does installations on the side. If you're still looking I could try to get a phone # for you. We just got a wood playset from Backyard Playgrounds. They gave us a custom playhouse for cheaper than Creative Playthings, and the one you can get at Lowes. They leveled the ground, and built a very sturdy, great looking set. They even built us a ramp from our deck to the playhouse! They were very helpful and easy to work with. My kids have been playing on the set nonstop. We love our Cedarworks set. Very well built, great customer service. Pricey, but worth it in our opinions to have a good looking set that we are going to have to look at for years. Cedarworks recommended an installer who charged a percentage of the cost of the set. It took him about 13 hours to put it together. He needed to do a little bit of leveling to make it sit straight. This isn't a great pic, but it is the only one I have on the computer.